Former President George W. Bush said President Barack Obama would be “naive” to lift sanctions against Iran as part of a nuclear deal and that Obama’s decision to pull out of Iraq led to the rise of the Islamic State. Bush’s remarks were made during his keynote address on US foreign policy in Las Vegas on Saturday. The former president spoke to an audience of hundreds of Republican Jewish Coalition donors, at an event that was closed to the press. 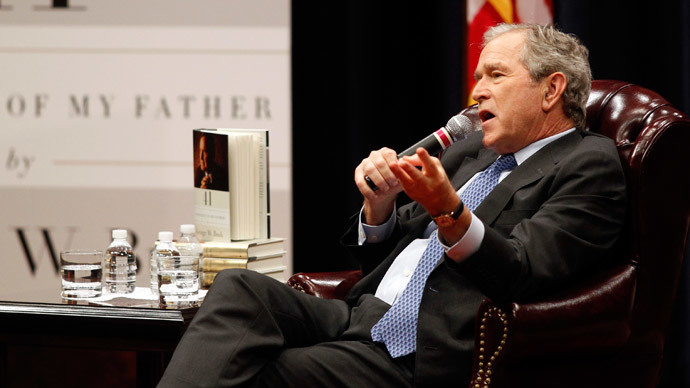 Bush told the audience President Obama is being naive about Iran and the pending nuclear deal, according to notes leaked to The New York Times and Bloomberg View. Bush noted that Iran has a new president in Hassan Rouhani, but questioned whether his election marked a course-correction for Tehran. The Daily Beast reported that Bush received $250,000 for his rare appearance. Bush said Obama was placing the US in “retreat” around the world. The plan to lift sanctions on Iran was a promise that could boomerang, Bush added, and would be bad for American national security. “You think the Middle East is chaotic now? Imagine what it looks like for our grandchildren. That’s how Americans should view the deal,” said Bush, according to a transcript provided to Bloomberg View by a dinner attendee. The Republican Jewish Coalition is a pro-Israel lobbying group linking Jewish-American neoconservatives to the Christian Right and the Israel political group Likud.